This post details the build process of my first model in 2017, Sigurd’s General Goods: a medieval general store based off of the store Bits and Pieces from the game Skyrim. Despite being a very detailed model, it came together rather quickly, perhaps partly due to having reference images to work off of, and also having more free time during winter break. This was one of the main images I worked off of. I messed around with plates until I got the proper size and layout needed. Figuring out the hinge placement for the opening interior feature was another early step, and I ended up placing the hinges overhanging the wall by one stud allowing the opening function to work smoothly despite the depth of wall texture. Then it was time to begin on the stone walls. The bottom 2 layers were purposely built to slope out a bit for a larger foundation affect. Since there was also a full interior, I needed to plan that out before getting to far with the walls. For the inside of the walls, I used simple studs up bricks, with log bricks and masonry bricks for texture. Some reddish brown columns served as supports for future floors, and broke up all the dark bley. In addition to the hinge points being a stud farther out than the walls, I did basically the same thing with a 2×2 column at the corners to give the appearance of buttressing. Since arches over the windows would not have fit with the window configuration, I just used 2 and 4 long brick modified with stud directly over the window frames. Here you can also see the first little bit of roof over the wood storage area. Back to the interior: the chimney has been built and a rug in the entrance-way added. A slight challenge with the fireplace was that it had to split in half to allow the building to hinge open. That limited the design options a bit. Here the first floor is basically finished, and I’ve begun to layout floors and such for the second level. The stone ledge between stories was accomplished using 2×2 and 1×2 jumper plates, which you can see the start of on the left side here. Now the stone ledge has been finished on the near side, and the beginnings of the tudor sections added. This roof over the door was a tricky one to build with the half stud offset and small stone section under the side. I used plate with clip and plate with handle to attach the wooden eaves, and some placeholder pillars allowed me to figure out the proper slope and attachment point before building the actual wall. On the right side the stone wall continues for two stories, with a tudor addition off the front. Like the other tudor sections on the building, it used half stud offsets to make the wooden beams deeper than the plaster sections of wall. That addition was lower, giving a sunken floor on the interior which is something I had not done in a building like this before. The plates to hold the tiles for the entrance roof are in place,and ready for tiles to be added. I over hung the tiles one stud on the bottom and top to allow the roof to fit snugly against the wall on top and ledge at the bottom. This roof tiling was later revised to include more dark tan tiles and sizes other than 1×2 when I realized I would not have enough parts otherwise. The other tudor sections are ready for roofs now: inverted slopes were a simple and sturdy way to bring out the top of the walls. Here again, I set up the plate framework to allow the roof tiles to hang off one stud. Onto the third story! This floor had the simplest layout, being a basic rectangle. The stone wall continuing over the entrance area accentuates that area and adds more interest to the building as a whole. Because of the half stud offset of the roof below it, that wall section ended up being an odd number of studs wide. On the left, you can see the chimney nearly done, using it as the hinge point worked out quite nicely in this instance. 1×1 round plates and dark tan plates were used to texture the plaster and give a worn look. Just about ready to put on the final roofs! On the left end I’ve built up the plaster section the roof will fit over. That process was mainly trial and error, comparing the fit of the roof over the slopes and seeing what level they needed to be at. Roof eaves added, and the plate frame for the actual roof begun. The peak shape and decoration were borrowed directly from the reference image. The before mentioned odd width of the top stone section gave me some trouble at first as I wanted that top most window to be centered. Eventually a 3 stud wide window was the simple solution. Now began the trickiest part of the model: the large dormer roof. This was again a process of trial and error in which the final solution utilized wedge plates and a few half stud offsets to get the proper fit. Some 1×1 round brick columns fit over the top to cover any small gaps. You’ll notice that all the roof tiles in that section are medium dark flesh right now, I later went back and re-tiled those sections to have a better mix of dark tan and MDF after the design was finalized. I tiled all the roofs at once so I could see how far my parts would go, and I ended up having enough tiles to finish all the roofs in the planned Medium Dark Flesh and Dark Tan tiles. If I had run short, you would have seen this model in a winter setting as snow would have been my way of stretching the tiles farther. At this point the whole building exterior is complete. So then I finished off the interior as well. With this model I built the furniture before furnishing rooms, rather than deciding I needed a table for a room and building it, or a bed then making that, etc. What I like about that is that it allows me to focus on neat furniture designs, and then mess around with what placement works best, as opposed to deciding beforehand where each item of furniture will be located. A simple base was then built with cobblestone (credit to Legopard) and a little bit of landscaping which I set the building onto. Final finishing touches were the woodpile and cart. And here’s a final look at the finished model and original reference image. I hope you enjoyed seeing this behind the scenes look at what goes into creating a model like this, and if you have any questions, feel free to ask. 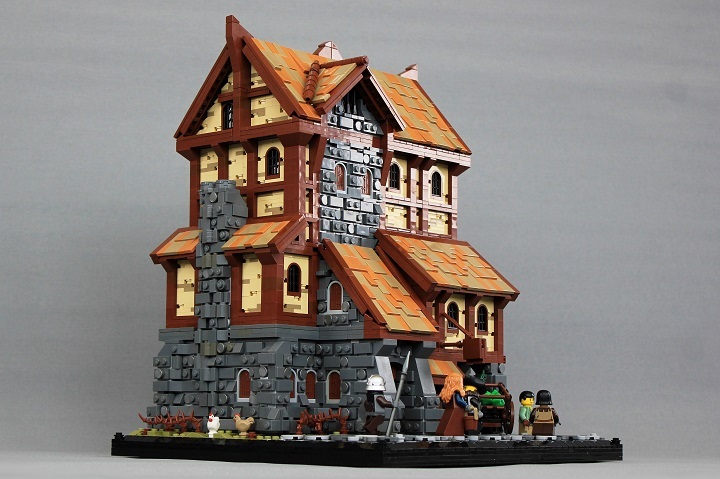 Building, Creation, Design, General, LEGO, Medieval, moc, Model, Roof, Skyrim, Stone, Store, Wall, Wood. Bookmark.